We finally got our own starter piano. 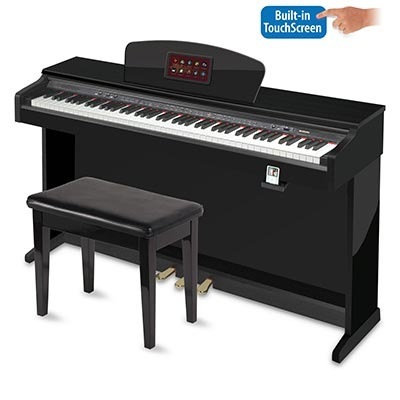 It’s great for its price, and we’ figured it’s good to have a “starter” piano so the kids will be able to put wear on it and we won’t have to worry about it getting ruined. I know as they grow up, they’ll be pretty tough on it. We opted to get a digital for now so the volume can be controlled. Kids learning piano tend to pound on the keys (experience talking). So they’ll be able to play it day or night. Also, it’s easier for me to control the volume when the girls are sleeping. It also has touch sensitivity and the keys are weighted, which is important for any piano player, to building finger strength. The sound is pretty good for what you pay for, but I’m so accustomed to the real sound of piano hammers hitting the strings. But, this is a great practice piano for now. Maybe when we have a bigger place and the kids are better at playing, we can invest in an acoustic instrument. Only pain is having to get it tuned all the time…I always hated that, growing up with the upright piano at home. But the sound is so authentic. I love the piano we have at my mom’s. So here it is…our first piano! Thank You Lord for your many blessings. Now, hopefully, I can practice, instead of relying on sight reading so much.